This week on Twitter a bunch of friends were cracking wise about some L.A. Noire crossovers with other video games. That seemed to be as good an idea as any for this week's 'Shop Contest. Don't worry, I've included images. Source Images: Interviewing, interrogating, and badgering suspects. Phelps also gets real grabby at the crime scene; it's funny how driving a car past the perimeter contaminates all the evidence, but Phelps pawing a gun and getting his prints all over it doesn't. Anyway, here he is doing that. Funny objects could be swapped into his hand. Source Images: Phelps handling evidence; Phelps handling more evidence. 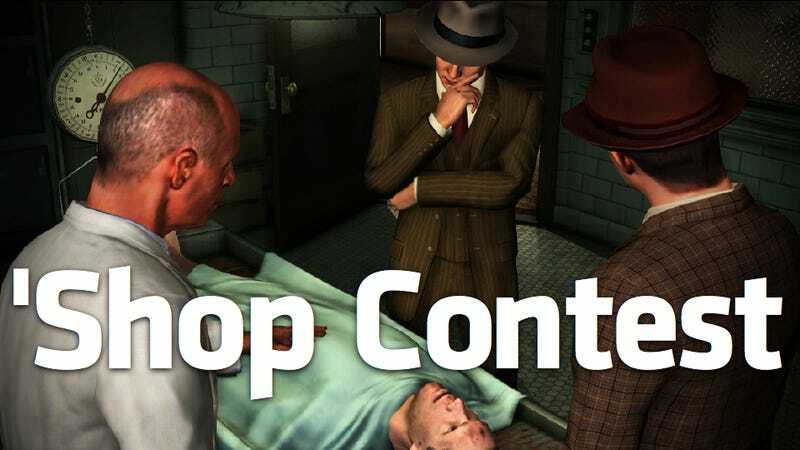 Further, if you've played L.A. Noire, you've come to expect Caruthers, the medical examiner, at the beginning of nearly every case. Given how much death happens every day in video games, I suspect he could be a hilarious guest-star in someone else's world, or they could guest-star in his. Source images: Caruthers and a body; Caruthers and detectives; Caruthers and another body. Finally, in about 18 months of the 'Shop Contest (really, it's been that long?) I've noticed how frequently Mass Effect dialog wheels come up as a joke. I think L.A. Noire's "Truth/Doubt/Lie" system is the next evolution of this. While I don't think this image is particularly exploitable, it gives you an idea of how the options show up in-game. Obviously, this overlay on other photographs, particularly non video-game ones, could be funny. Source image: Truth, Doubt, Lie in action. By no means are those your only options. A Google image search turns up numerous high quality screenshots of L.A. Noire so feel free to look for those, too. Also, one advantage you have here is to desaturate the color completely, as L.A. Noire includes a black-and-white presentation mode for that extra hardboiled feel. Use that if you want. Just include some game element of L.A. Noire and make it funny. If you're stuck, there's got to be about a thousand O.J. Simpson jokes here. 8. This is important: Keep your image size under 1 MB. It will not upload to comments if it is over that size. 'Shop entry will be uploaded to the comments.